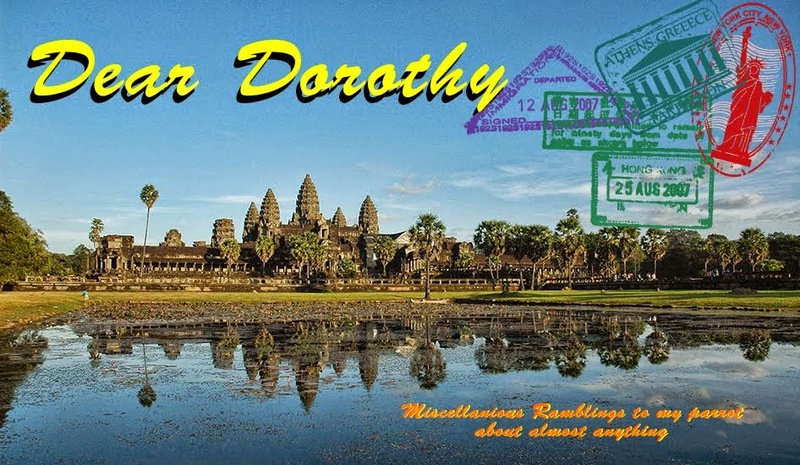 Dear Dorothy: And yet another bus ! Don't read too much into Lonely Planet's hotel descriptions. Well it is the vernal equinox, maybe it is the other one. I am in Kep a small beach side community on the Gulf of Thailand. In the 1950's the French used this town as the get away resort from the heat and bustle of Phnom Penh. Beautiful villas lined the shore line, maybe villa is too small of a word to describe them. Mansions could be a better description. After the French departed the wealthy and powerful Cambodians acquired the villas. Of course during the Khmer Rouge time this place was virtually abandoned and the villas fell into disrepair. Now nearly 25 years after the Khmer Rouge and the Vietnamese war most of these villas are still abandoned. The few I spotted on the ride to my current residence were windowless with burn marks coming from the windows and doors. The town is slowly coming back, but slowly is the optimal word there. I came here for their famous crab and to sit near a sea beeze sipping a cool one after a day of exploring the local area. I don't quite have that at the moment. My bus left Phnom Penh at 9:30 this morning. I awoke shortly before the sun rose and watched it's yellow orb blaze through the prepetual humidity haze that I've experienced this entire time. I don't think I've seen a blue sky or sharp contrast shadow this past week. No clouds in the sky, but just a continual haze. I think of the photos of the area with the bluest of blue skies must have been Photoshopped or on one of the two days a year when it's not hazy. I returned to my room to take a shower and stuff my baggage and then go down to breakfast. The shower came on and wouldn't you know it. No hot water. It wasn't cold but nothing you'd want to stand under for more than a few moments. I decided a good scrubbing with a washcloth and soap would have to do after I shampooed my hair. Before I had finished working up a lather the water pressure dropped. It dropped so much that the little metal pull that you use to change from bath faucet to shower would not stay locked in the shower position. So it was one hand pulling up on the metal thingie and rubbing to rinse away the shampoo. Heck, it will be back up in a minute or two, so slathered some conditioner on. It never ever came on strong enough to hold a shower. This is from a hotel that cost $85 a night, not some backpacker hostel. I think I'll title my Trip Advisor review "A pig in lipstick" it will probably get past their censors better than "The transvestite of hotels - It looks real, but it isn't". Now service I have absolutely no problem with at that hotel. It was par excellence. They made the arrangements for me and got my ticket. This morning the desk man made several calls for me to book a hotel in Kep that were recommended in the Lonely Planet. The Jasmin Valley Resort was the first phone to be either answered or not in service. A bungalow was $39 and a tree house was $59. I decide to go with the cheaper option I was only going to use the room to sleep and hold my valuables while I explored the countryside. The little bus arrived to drive myself and another couple to the big bus and in short order we were fighting city traffic enroute to then open road and points south. The ride was a ride. Estimated time enroute four and a half to five hours. This trip took six hours. there was some sort of mass of people blocking the road in one town and they would not yield the road to us. The truck in front of us made it through and we were stuck behind a wall of people for an hour before we were able to snake our way through them and continue our journey. I don't know if it was a protest, or perhaps the celebration of the equinox as it was around noon, but I never found out. The driver tried to nudge his way through them and we were hit with a bottle. Fortunately it was a plastic water bottle, but none the less it did make me survey my surrounding for the emergency exit - just in case a speedy exit was necessary. We got into Kep and all the passengers were surrounded by tuk-tuk (remork moto drivers ( a motorcycle pulling a four seat covered cart)) drivers. What is your name? Where are you from ? where are you going ? Okay I know that place. You come with me. Five dollars. I decompressed from the bus ride and waited. The most aggressive driver kept telling me how hard it was to get to my hotel. How it was on a bamboo trail, Yadda-yadda. Ya, I've heard that crap before. Finally one guy dropped down to $4 and I gave in as well. At which point the pushy guy dropped his price to $4 and didn't understand why I hired the first four dollar offer. One thing is for certain. The five dollar guy didn't lie. It was a bamboo trail. Pavement, gravel, dirt, rutted dirt, big holes and finally - "We stop here and walk rest of way." WTF ?!?! Why ? "The moto no make it." We each grabbed a bag and trudged up the hill for about 200 yards. He was a little winded when we did make it reception. I gave him a $5 bill and he said "You want dollar?". No thank you, you earned it buddy. The resort is billed as eco friendly. That means a bit of a premium to the cost for those three letters 'eco'. No 220 electricity. No 110 electricity. 12 volts D.C. power from a battery in the room. No hot water (at least I was smart enough to ask this time.). No curtains. No wi-fi, but you could use their iPad that had a SIM card cellular connection for checking mail. The pool is a great shade of jade, because it is naturally filtered, meaning it think - not. It is set high in a rain forest and surrounded with lush green plant life. The staff and guests whisper then communicating. If you want to get away from it all and let your leg hair grow this is the place. It is not what I was expecting. Maybe if I had been husteling from Wat to Wat and tuk-tuk to moto for the past week I'd be raving about just how wonderful it is, but I did my chil-lax'in on the boat. I planned to stay here three nights, but think it's back to hotel hunting tomorrow. Back in the land of 220 volts and maybe hot water - with free Wi-Fi of course. Yesterday afternoon I took a nap and then went to Foreign Correspondents Club for dinner. It is a must for tourists I doubt a foreign correspondent has been through the doors in decades though. I had a bar stool on the top floor overlooking the river and the corniche below. The menu had several potential offerings that looks enticing, but the Fish Amok and the Duck Curry were my quandary for the evening. I asked the waitress and she resoundingly said the duck. Boy was she right. It was excellent. It came with rice and I ordered a local Ankor beer and a bottle of water. The entire bill was $12. View, great meal, a little alcohol all for the price of a couple latte's. Now that was a score. I dodged and wove my way back to the hotel through the incessant calls of the tuk-tuk drivers and took advantage of the free Wi-Fi by sending the journal entries that I couldn't while on the ship and updating my blog with a couple pictures as well. Lights out a bit after ten and up at six. That is my life for the previous 24.